Roomy, comfortable, and full of storage options, the Timber Hawk Killshot is ideal for both day hunts and multi-day backcountry adventures. Small enough to quietly navigate thick timber, the Killshot’s main compartment has enough capacity to hold several nights’ worth of gear and pack out meat afterwards. Crafted of polyester brushed tricot with PVC backing, this quiet-cloth backpack includes a pull-out orange blaze rain cover to protect and provide visibility when needed. 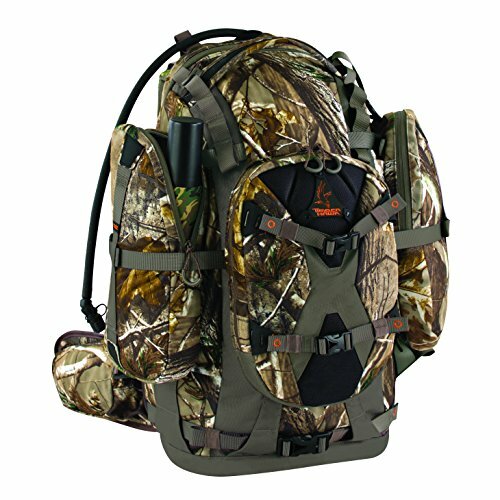 It also comes with a two-liter hydration bladder with insulated hose, and can also carry a rifle or bow in several different ways. Raptor compression straps shrink the pack for load stability, while right and left hip belt accessory pockets give instant access to gear or snacks. Other features include the Hawk-Eye binocular strap system, Silent Stalk quick-ejection clips for dropping the pack in a hurry, bottom and top lashing points for external storage, a drop-down scabbard for secure rifle storage, an internal spotting scope sleeve, and dual shoulder strap pockets for radios, phones and GPS. A quiet, durable twill lining, padded front organizer, fleece-lined accessory pocket, and removable shoulder strap pouch with magnetic closure safely store most anything your hunt will require. Founded by Mike O’Reilly and Paul Thomas in 2005, Timber Hawk aims to make your time in the field a more fulfilling experience. Their pack designs were tested over years of heavy use in the Utah mountains and further refined with input from pro staffers and big-game guides.